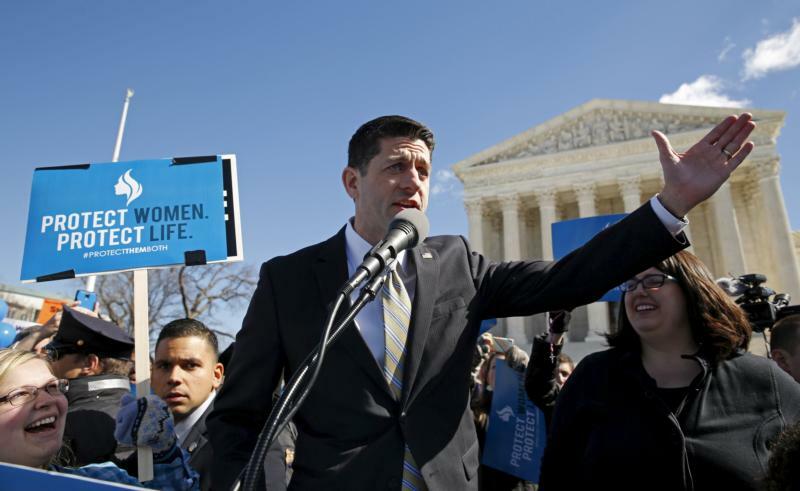 WASHINGTON (CNS) — The pro-life rally in front of the Supreme Court March 2 was under siege. It was outnumbered and at times shouted down by thousands of opponents, but it had something the others did not: House Speaker Paul Ryan. The Wisconsin Republican, a Catholic who has been a longtime supporter of the pro-life movement, is now the highest-ranking politician to speak at a rally outside the Supreme Court as the justices heard oral arguments. He emerged from the front door of the court building flanked by U.S. Capitol Police officers, and spoke for just a minute before heading back inside. Whole Women’s Health v. Hellerstedt, the first major abortion case before the court in nine years, deals with a challenge to a 2013 Texas law imposing new restrictions on abortion clinics. Provisions would require clinics to meet the same physical and professional requirements as a surgical center, and require doctors to have admitting privileges at a full-scale hospital within 30 miles of the clinic. Pro-life activities on the sidewalk began the previous evening with an all-night prayer vigil. The rally itself, organized by Students for Life, the Christian Defense Coalition and Americans United for Life, had only about 200 in attendance. A coalition of groups supporting Planned Parenthood and the court’s Roe v. Wade decision, which legalized abortion in 1973, had a few thousand, many of whom were bused in. That rally began before 8 a.m. local time while the pro-life rally began at 10 a.m. Both dispersed shortly after noon when the oral arguments concluded. The loudest competing cheers and jeers arose with the appearance by activist David Daleiden, who was recently indicted on a felony charge by a Houston grand jury over his tactics in making covertly filmed videos of himself and a colleague of his discussing supplying fetal tissue with Planned Parenthood personnel. The same grand jury declined to indict Planned Parenthood over alleged criminal activity in how it handles fetal organs and tissue.